Tampa’s Lowry Park Zoo has been one of my favorite places for many years. I volunteered as a Docent and as a Keepers’ Assistant many years ago. When we moved farther east of Tampa it was just too much of a commute to make on a regular basis on top of my 9-5 job so I gave it up. But I still like to visit every now & then, especially in the winter & spring months when the animals are more active! Lowry Park Zoo is a relatively small zoo compared to some I have visited, so it is a zoo you can visit and see most of in 2-3 hours. But take your time and enjoy all the various areas and animals they have on display. It is always best to get to the zoo (any zoo) first thing in the morning when they open up to visitors. Most of the animals will have been in their nighthouses and will have just been let out for the day. The keepers usually place food and items for enrichment out in the habitat (I used to do that when I was a Keepers’ Assistant) before they let them out. So with a combination of “getting outside” & things to do, this is the best time for activity and interactions. My favorite images, whether in the wild or in a captive situation, are with some sort of behavior happening. This may be a single animal eating, playing or moving about or flying, or even better, two or more animals interacting via play or courting. This time the visit was all about babies! 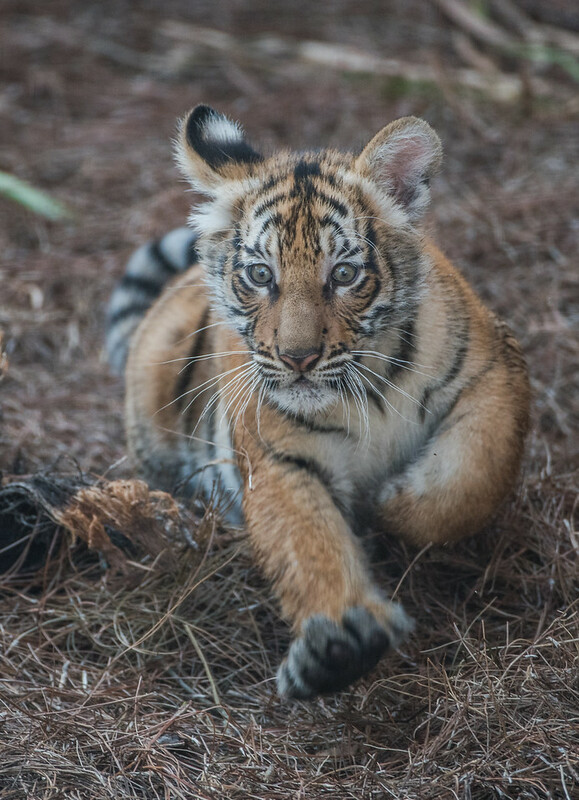 The zoo had just introduced their newest addition, a 3 month old Malayan tiger cub, out into the tiger habitat a couple of days earlier so I was eager to check her out. “Berisi” was active, interacting with her environment and her mother. Hey! The Water is Fun! Berisi checking out the people checking her out! 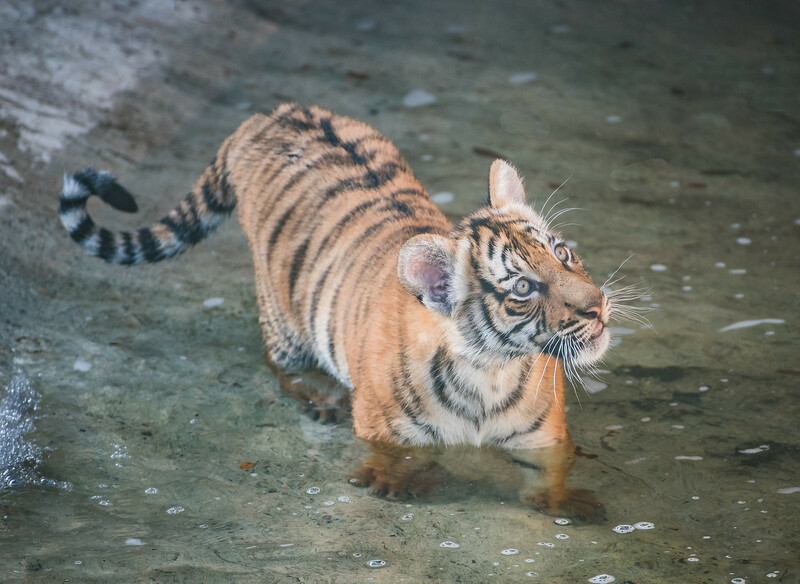 Like most tigers even this young cub likes the water! Stalking Mom! Berisi playing at stalking! On the prowl after her mom! Play behavior is similar to the behaviors animals would need to survive in the wild. After Berisi tired out a bit and started to lay about more I decided to move onto to other areas of the zoo. Close to Mom! 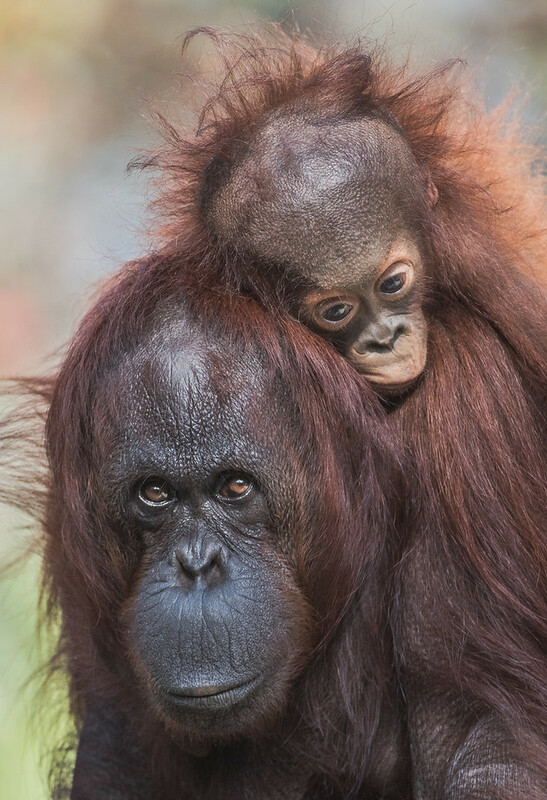 Very young orangutans stay close to their mothers. Over in the Primate section, the Orangutans are always active in the morning. They currently have a couple of babies so I was fortunate to get this image of one of the mom’s and her kid! 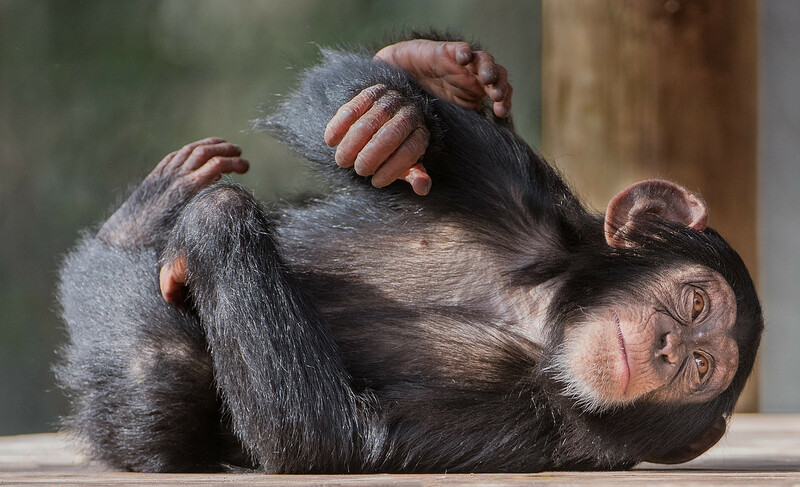 Chimpanzee youngster having fun rolling about the deck. 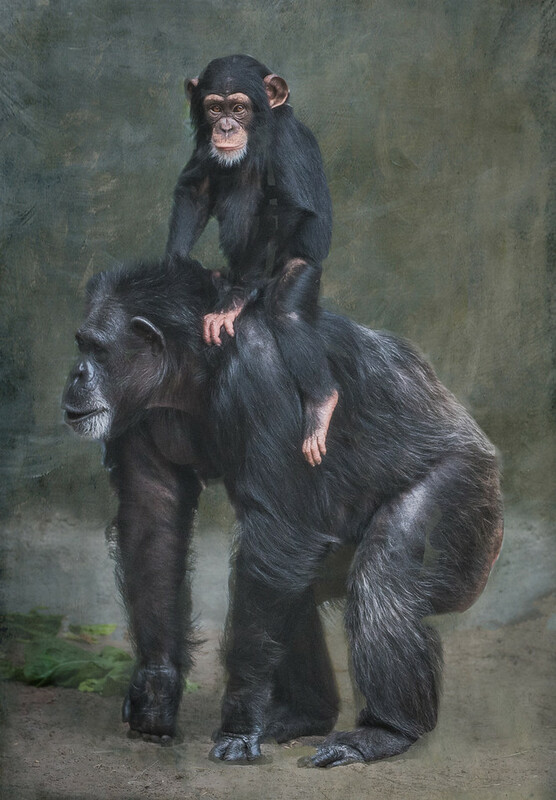 Lowry Park Zoo has had Chimpanzees for many years so I was glad to see that they have a youngster that was having a blast playing all over the habitat and also giving the old chimp a new lease on life! Fun with the gramma chimp! 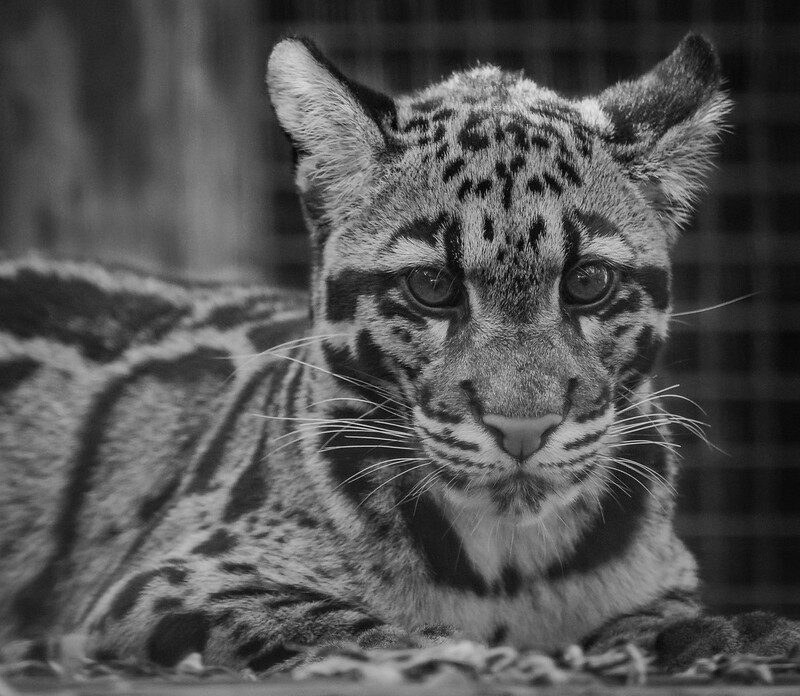 I then went back over to the Asian section to check out the young Clouded Leopard. He was not being active at that point but I was able to get a pretty good portrait even shooting through the piano wire on the front of his habitat. Tampa’s Lowry Park Zoo is a 63-acre (25 ha) nonprofit zoo located in Tampa, Florida. In 2009, Lowry Park Zoo was voted the #1 Family Friendly Zoo in the US by Parents Magazine, and is recognized by the State of Florida as the center for Florida wildlife conservation and biodiversity (HB 457). The zoo is operated by the Lowry Park Zoological Society, an independent 501(c)(3) charitable organization. The zoo also exists as a center for conservation of endangered wildlife both locally and around the globe. Tampa’s Lowry Park Zoo is accredited by the Association of Zoos and Aquariums (AZA) as well as a member of the World Association of Zoos and Aquariums (WAZA), Conservation Breeding Specialist Group (CBSG), the Florida Association of Zoos and Aquariums (FAZA) and the Florida Attractions Association (FA). Photographing at a zoo can be a challenge for a number of reasons. Fortunately, Lowry Park Zoo allows tripods, so I brought mine and primarily used it at the tiger habitat. One of the challenges with a new addition to a habitat, especially a baby, is just getting a spot that you can view from for the first few weeks. I waited a few minutes until a spot opened up where I would have some space to shoot from. This tiger habitat has fairly heavy gage black wire on the viewing area that is above the water at the front. So I parked my Induro Stealth GIT 304 tripod with the Wimberley Gimble head, my Nikon D810 with the Nikon 200-400mm lens right up against the wire. I focused on the tigers through the wire. As you can see from these images, as long as a kept that lens close to the wire my subjects were sharp! 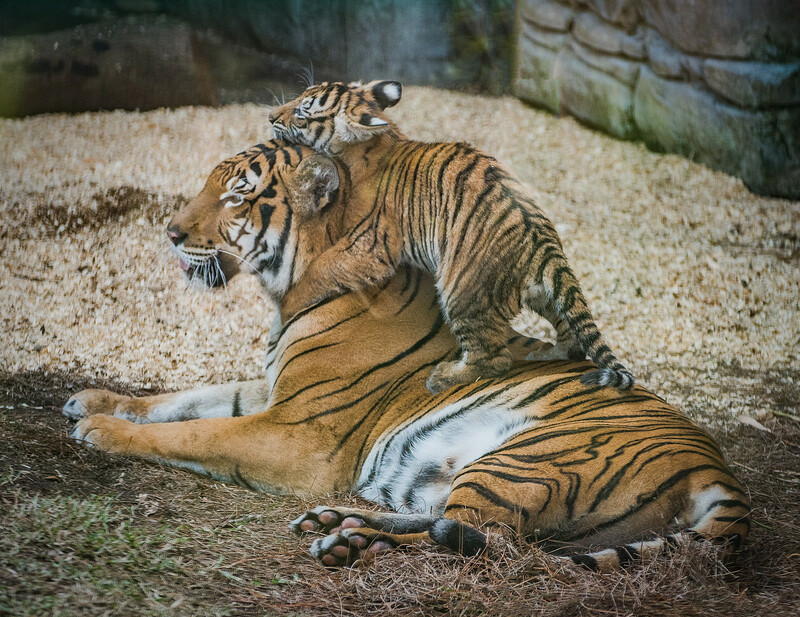 The one image I shot through the plexiglas (the image above with the cub on her mom) was a bit soft & I had some glare to deal with. Since these animals are captive, you would think it is easy to get great images but that is far from reality! The light is a constant issue, too dark, too light, mottled. The enclosure materials, structures and trees in the habitat can be a problem. Then you add in the animal or animals and their behaviors, or lack thereof, and the challenge is immense. You need to be patient. Stand and watch what that particular animal(s) is doing and where. Then try to situate your camera in the best spot possible. Then wait for the action and when the animal looks at you. Getting those eyes with a bit of catch light in them and looking straight at you is a very compelling image. Shoot a lot of images as some will be blurry. Check your images versus settings to be sure you are not over or underexposing and that you are getting some in focus! You may need to increase the shutter speed to catch the action. Then come back at a another time of day for different light or more or different behaviors. Also, different times of year give you varied behaviors. 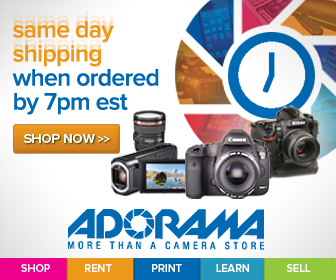 The more you photograph the better you will get at this. The zoo is sort of a practice place for photographing in the wild but this is still not the same as finding and capturing those images of animal moments out in nature! If you are in the Tampa Bay area or Central Florida please visit this wonderful small zoo. Check out Lowry Park Zoo’s website for schedules, animal lists, events and education! Please checkout my LPZ Gallery for the originals and more from this visit! Also, see my Zoo Animals Gallery for images from previous visits.